For those of you less cosmetically inclined, there is a restaurant review here. Go read it. But! Wait! All is not lost, because this story has a happy ending. And in these days of grim realism, we all want one of those. And we all, in the immortal words of the great Bonnie Tyler, Need A Hero. So here it is: I present to you my new favourite mascara, ever. This little beauty cost me £12 in Glasgow airport -- I think it’s about €17 here – and I’ll admit, I was initially only after the free autumnal shimmer eye palette that came with it. But with a couple of strokes, this has actually given me the defined, fluttery lash look I was hoping for from my ill-fated Chanel Inimitable Intense. My lashes look longer, curlier and separated, thanks to the ‘unique triple effect brush’, which had sounded so gimmicky to my cynical ears. Basically, one half is a standard mascara wand, the other half has shorter, comb-like bristles, and the top has that roundy applicator shape that’s become quite fashionable (à la Givenchy Phenomen'Eyes and L'Oréal’s Telescopic Explosion). The comby side was very appealing because the Chanel mascara is really crying out for something like that. The Boots one doesn’t seem to need it though, because the mascara hasn’t clumped once yet. And the rounded tip is perfect for the teeny wee lashes on the inner and outer corners of my eyes. It doesn’t give me ‘fat lashes’, which I quite like, but as it’s easy to apply, doesn’t smudge and gives me great coverage, definition, separation and length, I think I can let that go. And what about you? Any budget beauty booty you care to share? I got this for the palette an' all and I really, really like it! The end. Is the eye palette any good? It looks as if it lacks pigment, like the Bourjois shadows which I find really annoying. Mad that the Boots mascara is better than the Chanel one! I'm looking for a new mascara will have to pop into boots! @Roxy - pigment is grand, except for the goldy one, which is a bit wishy washy alright. And here, now, I'm not saying the Boots mascara is definitively better than Chanel, just, y'know, in my own recent experience. 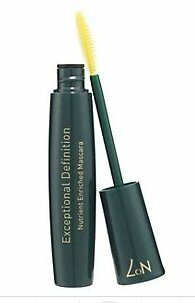 Boots No 7 Exceptional Definition Mascara- 12 pounds. @FOXPAWS, the hell with the UK, get yourself over to Dublin! having experimented wildy with mascara since you moved out the family home and I couldn't nick yours, I'd pretty much settled on YSL's false lash effect, the only mascara that ever did owt to my short stubby lashes. but for everyday wear it's a little pricey and I've never much been impressed with how quickly it clumps. so armed with paydays funds and this review I got Boots own exceptional definition badboy and yup, chuffed to bits with it. cheers lass! it gives me length (much needed) and awesome definition and I love the gimmicky 'get the tiny little lashes in the corner' brush. that all said, I traded it in two days ago for permanent lash extensions negating the need for mascara of any kind. and finally I have the lashes I've been envious of since I was 12!